Did you know that passengers can bid on room upgrades on Norwegian cruise line? I got the opportunity to bid for a room upgrade on an upcoming trip and “won” a balcony cabin for a crazy low price.My friend Merry Ellen and I have a fabulous European cruise planned in 2018, and the itinerary is only available on Norwegian Cruise Lines. The two of us love cruising and have easily done 15 cruises each on four different cruise lines; this, however, will be our first adventure with Norwegian. He didn’t return phone calls, moved our cabin to another deck without our permission, gave us incorrect info, and basically bungled every thing he tried to do. We’d never had this much trouble before on any other cruise line. About a month after we learned our “personal reservations specialist” was gone, we got a supervisor to move our cabin back to the deck we originally made reservations for. Merry Ellen and I save all year for a blow-out cruise adventure, but don’t spend money unnecessarily. Therefore, we usually get an inside cabin — the cheapest one possible — since we’re out on shore excursions nearly every day. We decided not to bid at all for a ocean view room (who wants a porthole? ), but to bid $100 each for a balcony cabin. That amount, according to the online Norwegian “cruise meter,” was considered a “poor” offer. When we entered our amount, the meter, in fact, barely moved from zero! Since it didn’t cost us anything to bid, we went with it and sort of laughed it off. Several weeks later, however, we got emails telling us we’d been upgraded to a balcony room for the amount we bid! We feared that room was deep in the bowels of the ship (where we never want to be), but we were astonished to find the new balcony room is on deck 10 — our preferred location (near the pools and informal dining room). Norwegian definitely made up for the painful reservation process by rewarding us with this room! If you sail on Norwegian in the future and receive an offer to bid on an upgrade, by all means take it. If you submit a winning bid, you could move to a much higher level room worth up to $1,000 per person more than you originally paid, like we did. 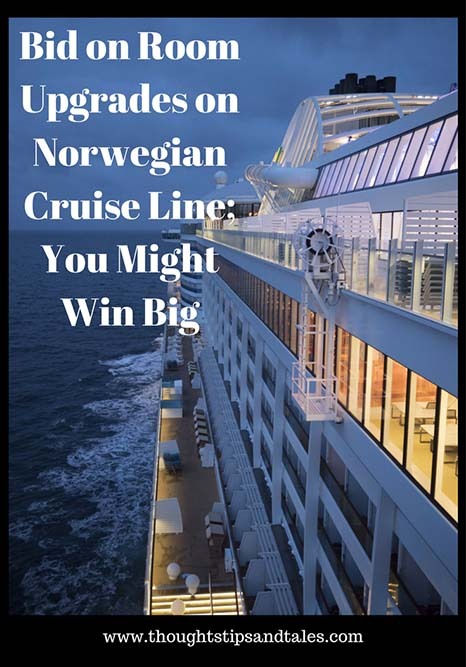 This entry was posted in life and tagged bid on room upgrades on Norwegian cruise line, bidding for cruise room, cruise, cruise room upgrade, cruising, Norwegian, Norwegian cruise line, rooom upgrade. Bookmark the permalink. As a frequent cruiser, I would never get an inside cabin. Did that once and deeply regretted it. Whatever you can afford with a balcony is fine. Depends on if you want to cruise, or if you want to party. I just got upgraded from a balcony to category M!, aft facing mini suite. I also put in bids for several Haven cabins. My bid was on the bottom end of fair on the meter. We got the email 13 days before our scheduled sailing on June 7. My bids on some of the Haven cabins were in the upper fair section on the meter. I am happy with the mini suite with large balcony, because it cost us a whole lot less money than any of the Haven cabins could have. Since I didn’t approach them — they contacted me by email about the upgrade/bid — I’m sorry I can’t help you. It would be interesting to know if they offer it to everyone or to only people in certain classes, like inside cabins — or only first-time cruisers with them. Who knows?? blogqueendiane-I was a travel agent for 17 years a while back. I booked our last several cruises myself because I know what I want, and have the background experience. I got several calls from the cruise line specialists. I declined their help, as I do not think they have the inspiration and motivation to help people. I am now a home booking agent with Cruise Brothers, as well as keeping my day job as a teacher. This way I will at least get commission on my own bookings and of those of my friends and family. All of the things I did as an agent are coming back to me. MY point is, use a travel agent. You do not pay more for their services, and in many cases you either pay less or at least get some perks like shipboard credit. I am able to give some kind of goodie on every cruise I book. Glad your experience of the NCL bidding process, mine has been awful! I’ve bid twice and each time didn’t ‘win’ an upgrade – and that’s fine, I was still happy with the cabins I had booked. The issue came with my upcoming booking to the adriatic on the Star. I’ve booked a suite and so has my brother and his family. We were looking to book the Villa, which is a 3 bedroom suite but both of them were already booked. Only one other suite, the lowest category of suite was not available to book. Two days after calling NCL to enquire about the Villa, and being told both on the phone and from the information showing on the NCL we site that there was no availability for the Villa Suites, we both got an invitation to bid for an upgrade on the Villa ! We called NCL again, who couldn’t explain and we were told the bidding process is dealt with by Miami head office. So I emailed and asked NCL on their face book page for an explanation. My email wasn’t answered, and the social media term didn’t answer my question and just referred me to the terms and conditions of the bidding process. Way to go for customer services! I messaged them again on social media, and they just refuse to answer my question. I just want to understand, why they are inviting me to bid on suites which I know are not available – it makes no sense! NCL is a great cruise line to sail on, and the service on board is wonderful. However, the NCLl customer service over the phone/social media/email – is truly awful and incompetent. Wow – sounds like a really bad experience. I have to agree that NCL’s customer service on the phone is horrible. We had the same kind of issues where people gave us wrong or conflicting info. They really need to work on improving that! Hope your Adriatic trip is great and the cruise makes up for their customer service issues!